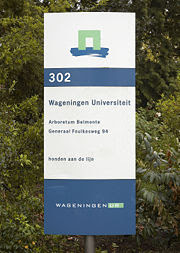 Wageningen University was established in 1918 and was the successor of the Agricultural School founded in 1876. Wageningen University provides education and generates knowledge in the field of life sciences and natural resources. Wageningen UR aims to make a real contribution to our quality of life. Quality of life means to the university both an adequate supply of safe and healthy food and drink, on the one hand, and the chance to live, work and play in a balanced ecosystem with a large variety of plants and animals. The university has about 6,000 students from 98 countries. Its core business are life and agricultural sciences. Wageningen University offers 18 BSc programmes (2005-2006). The language of instruction is partly Dutch, partly English. For some BSc programmes the language of instruction is English. The programmes start each year in September, they last three years and consist of 180 ECTS credits. The programmes are in the field of economy& society, health, life sciences & technology, nature & environment, animals & plants. Wageningen University offers a wide range of MSc programmes (2005-2006). The language of instruction is English. The programmes start each year in September, they last two years and consist of 120 ECTS credits. Most programmes offer various specialisations and possibilities for majors. Able to function as an independent scientist. Able to integrate his/her own work in the theoretical framework of his/her discipline(s) in a broader area of research and able to communicate this in a scientific or general setting. Competent in identifying priority areas of research and in formulating questions and experimental hypotheses pertinent to this research.